Somewhat to my surprise, I find that I actually like using the Sony NEX-C3. The image quality from the 16MP sensor is excellent. It works very well indeed at high ISO's and produces good sharp results at low ISO's. The menu system is improved from the NEX-5 I used before and for such a small camera it has an impressive array of functions. The focus peaking option is truly innovative as far as I'm concerned and it makes using alternative manual focus lenses easier than anything I've used before. The lenses, while not achieving the heights of m-mount and Nikon primes, are capable performers. To my eyes the 18-55mm produces better results than the 16mm f/2.8, but I would be perfectly happy to use both lenses. Video is good, very sharp and with good colour. For 720HD it produces great results, though because of the lack of image stabilisation, I didn't find it particularly good for hand-holding. The issues I have with it are those that I knew about before I bought it. No viewfinder is the obvious one. I like viewfinders because I'm so used to one and also because I find them useful for composition and stability. 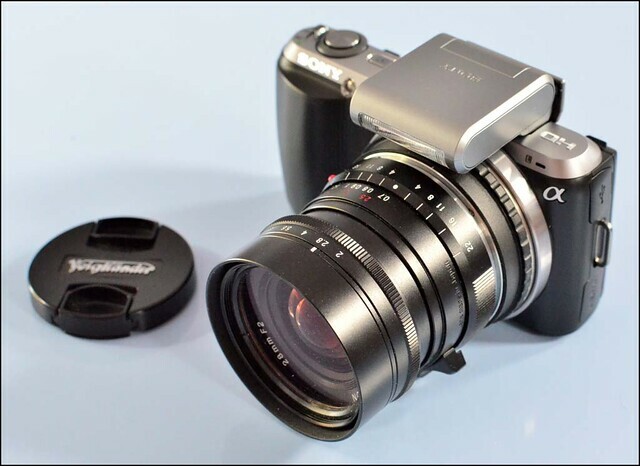 I also don't like really small cameras, and the fact that virtually every lens, apart from the 16mm f/2.8, is going to "overwhelm" the NEX-C3 is, to my mind, a design flaw. To be honest it doesn't affect the handling that much and over the period of time that I've used it, I can't say that its been uncomfortable to use. I would also say that it feels well made and pretty sturdy. Until Adobe releases the ACR update that supports it, I am hesitant to make a final judgement on the image quality and my comparison test with the E-P3 is also going to be delayed because of that. However for such a small camera it is capable of producing extremely impressive files. I couldn't really detect much difference between the results from this and my Nikon D7000. I doubt that many people would be dissatisfied with its output. To a large extent I've been treating this as a dummy run for what I imagine is going to be the Sony NEX-7, which if as rumoured is going to address all the "problems" I have with he C3. All will be revealed in about a week. I've been known to make less than complementary remarks about the NEX system, and the C3 has gone some way to making me change my mind about its useability and general usefulness. While I'm still not convinced that the NEX system, as it currently stands, is for me, there is no doubt that you get an awful lot of good things for your money. First and foremost there is the file size and image quality. Top quality and certainly equal to and in many cases better than a DSLR. I doubt that many people would be disappointed by the pictures it takes, and I'm certainly not. I am aware that I'm probably far from the target market for this camera, but I can see myself using it on all sorts of occasions when I want to work quietly and unobtrusively. It would also be a very useful "carry anywhere" camera. It certainly has a very small "footprint" and when paired with my Voigtlander 28mm f/2 Ultron it does have a certain aesthetic charm.